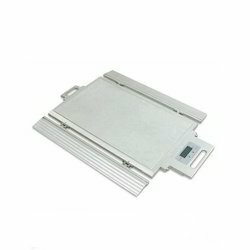 An Ultra Slim Weigh Pad is an ideal portable weighing system. Each pad is fed into a different channel, allowing individual calibration for each pad. A portable data case including rechargeable battery, dot matrix roll printer and LCD digital readout can be supplied for installations which require frequent shifting. The system is factory calibrated and ready to use when you get it. It can easily be setup by a single individual in minutes and is very easy to use and transport. Looking for Ultra Slim Weigh Pads ?